The Arc Knight leather welding jacket carries,uniquely innovative features and has set the,industry standard. Included in those unique features,shown below in the information section, are the standard features common to all Arc Knight tuff Lava Brown garments as noted above. This jacket also features a full-sized leather inside pocket and multiple-snap adjustable cuffs. A roll-up collar protects the wearer"s neck from spatter and UV exposure. 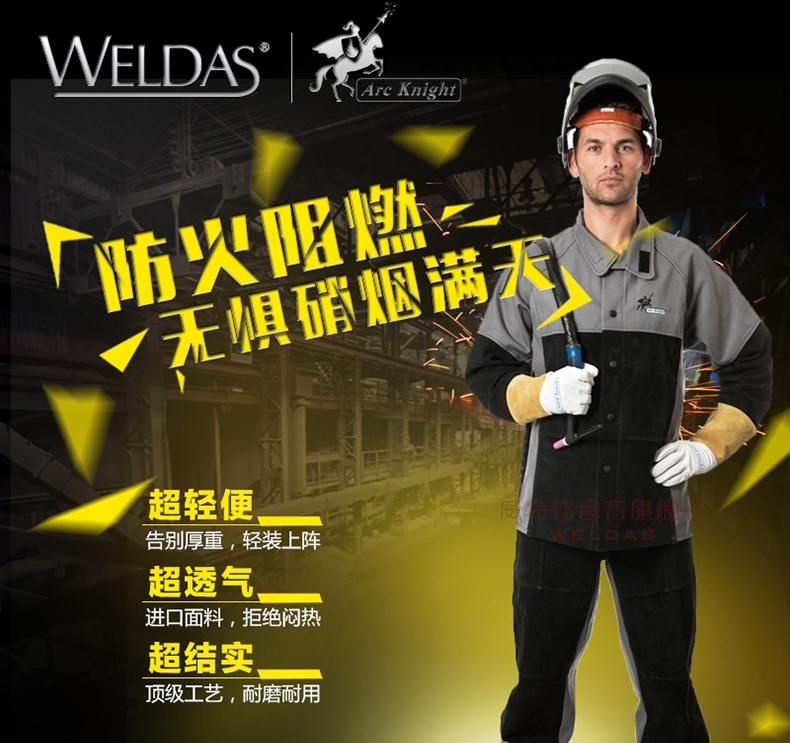 Durable welding jacket is constructed with heavy duty FR cotton to protect against heat and debris. Jacket with side-split cowhide is versatile - perfect for multiple welding applications, including those generally worn with full leathers. Jackets are designed with leather in areas that take the most abuse in day-to-day operations, for additional durability and protection. The interior spatter guard prevents sparks and debris from entering the jacket.Arc knight welding clothing,Designed to allow complete freedom of movement,The Lava Brown heat and flame resistant leather is made from durable and pliable side split cowhide.All leather seamsare double lock stitched with high strength 5-ply Tex 90 Aramid Fiber thread. Stress points are reinforced with doubledleather or metal rivets that,like the front snaps are electrical insulated. Material: Heavy Duty 16 oz FR Cotton & Black split Cow Leather,Flame Retardant Armid Fiber Sewed. 2: Roll up collar, Interior spatter guard, Dielectric snaps.